I did manage to force myself to sew over the holiday though. 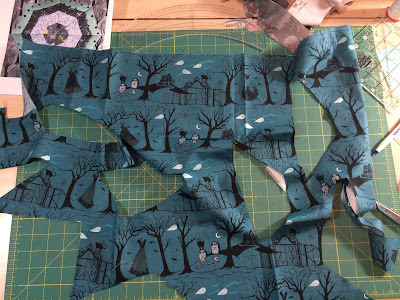 Sewing seems like a chore at the moment. 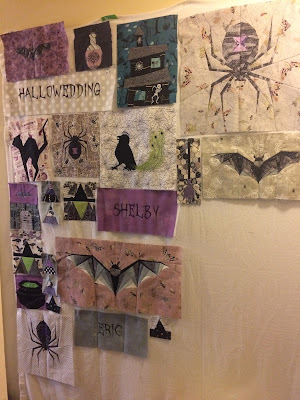 I want this Hallowedding quilt finished, but have been DREADING the rest of the blocks. and see how mine was really progressing. That is the only way I could assess what I have left to make. Nothing like a little visualization to get me moving forward! I wrote down the blocks I still needed to make and realized that some of the additional blocks that I had made fit in in place of some that the original quilt had! I still needed to make one more set of eyes. And holy cheese whiz Batman, this is what my background fabric for my first (of 2) spider webs looked like as I was cutting it out. I laid it out to make sure everything went in the same direction. 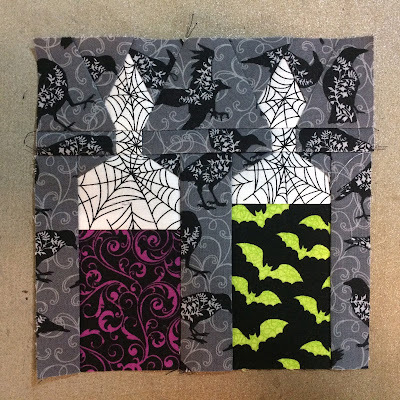 Then I made my first spider web block! Sewing the curves was not difficult at all. but three hours later it was finished. I have one more spider web left to make and then the Ring of Coffins. THAT'S IT FOR PIECED BLOCKS!!!! 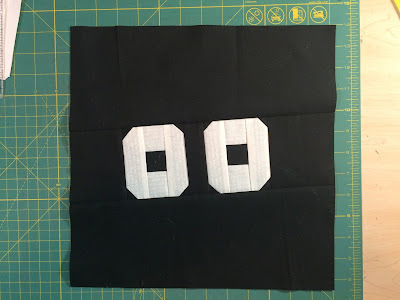 There are a few filler blocks that are just cuts of fabric. 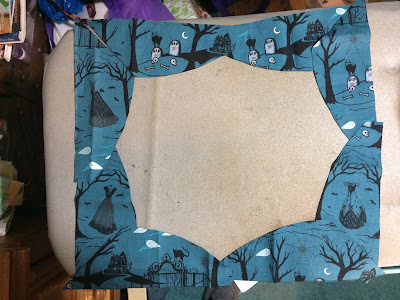 I also need to measure everything and size up or down to make sure it will all fit together but otherwise I am good. I have checked the size on about half of the blocks so far. Now what are you working on?? Share with us! I hope all my American friends had a fantastic Thanksgiving. Ours was busy leading up to the dinner but relaxing after that. 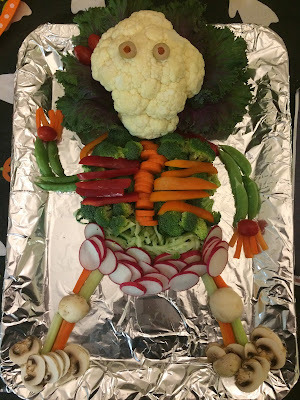 We cooked a turkey that our daughter raised and it was so good! My son came over with our (now his) dog. 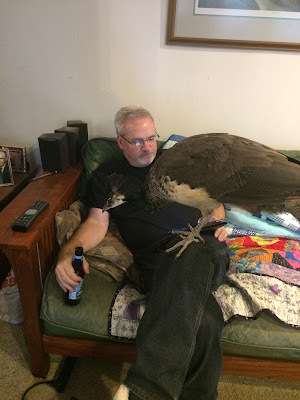 My daughter brought her peahen, Beep, who dined with us. She loves mashed potatoes! She doesn't really like my hubby so this is a rare photo! All in all a good time was had by all. What did you do on your turkey day? I can't say that I have anything new to share with you all, LOL. is getting things ready for the QAL coming in the new year. I have made a blog button for it and put it on my side bar. You can grab the html from the side bar and put this button on your blog if you are joining me. I would appreciate everyone spreading the word too. I hope we get a lot of people playing along. My goal over Thanksgiving is to make 2 entire blocks. One where the block finishes at 12" and one where it finishes at 16"
That is a LOT of HST! 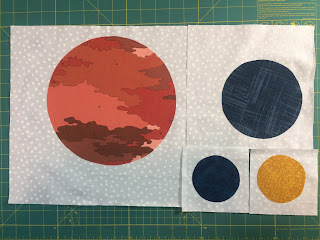 I have given this a lot of thought over the weekend and have decided that I will go ahead and do this as a QAL beginning after the new year. 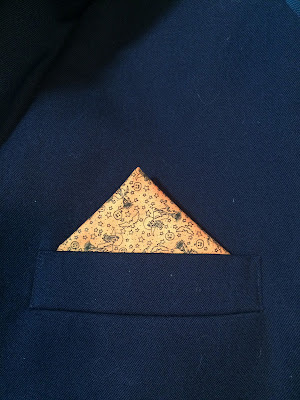 This will give you time to gather your ideas, some fabrics and a few tools. I made a test 1/4 of a block last night and used pretty small HST to do it. I want to make a full on circle and see if I can live with that size or if I need to make it larger. I am also taking an online course to learn to us my EQ software so will try to plan this out in EQ. Hopefully this will give me some ideas of yardage for you all. I am going to use various navies and white with a smattering of colored bits. My friend, Norma, did this and I fell in love with her version. trimmed to 2" which means they finish at 1.5" in the block. Her HSTs were 2.5" and finished at 2" in the block. This means my full blocks (the circles) would finish at 12" while hers were 16". I think I'm going to make one of each and see how I like them. The test quarter I did last night was using the 2" and I have to say it was not too bad to put together. you have LOTS more room for things not to match up. sew the same if you want you pieces to match up. Using such high contrast as navy and white I certainly want my squares to match up! I have a few things that I think will be essential for all of us to be successful with making this quilt. The number one thing on the list of MUST haves is a Bloc Loc ruler. and purchase the closest size of ruler. Now you can always go to the bigger sizes, but remember you will have a LOT of HST to trim if you are making a queen size quilt like me! 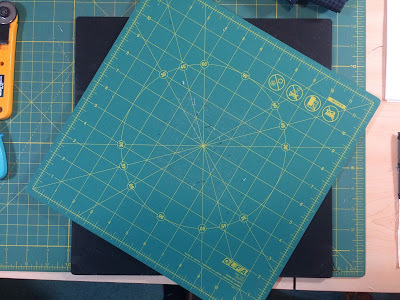 I find my precision is better when I use rulers closest to the size square I am trimming. I took out my 2.5" Bloc Loc ruler for my trimming. The amazing thing about these rulers is that the center if the ruler (on the underside) has a groove that LOCKS into your seam on your HST. Don't you just hate it when you are trimming and your ruler slips? This stops that from happening. 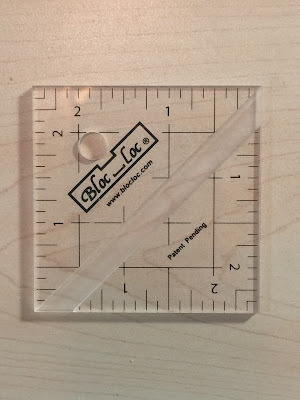 I LOVE my Bloc Loc rulers! You can find these rulers on their website here. these rulers are a little bit spendy, but oh so worth it! I got Set#1 for Christmas a few years ago and have never regretted it! Next up is the Clearly Perfect. (unless they are gigantic and won't fit on the CP, of course). (don't worry it is super easy). 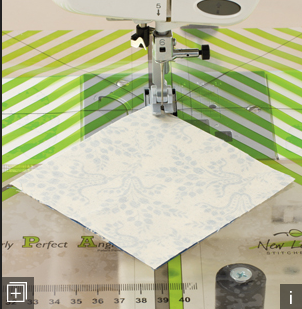 Once you have it all set you can sew really nice HST using this. You put your squares together and set them up like in this photo. The bottom "point" of the squares should line up with the far left line. You just keep that point on the line and sew. Then flip the unit around and do it again. You cut them apart (point to point) and voila you have 2 HST!! you will wonder how you ever did them any other way. so close to perfect is fine for using this if you are unsure. Another tool to add to your Christmas wish list! The next thing is a rotating cutting mat. When we will have so many HST units to trim this is essential! Joann's has them and you can use your coupon. 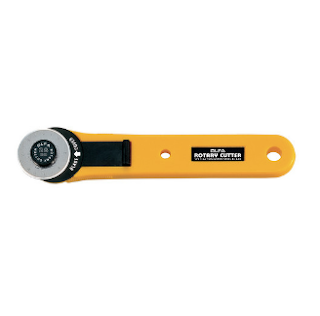 Lastly, another good tool is the 28mm Olfa rotary cutter. You can see mine in the upper left hand corner of the photo above. This blade size is wonderful for trimming small units. These are available at JAF as well so watch for these and maybe they will be on Black Friday sale! You may want to invest in some additional blades too, as you will be trimming LOADS of HST! So that is it for me for now. I suspect my WIP will be getting ready for Thanksgiving!! Are you going to play along with me in this QAL? 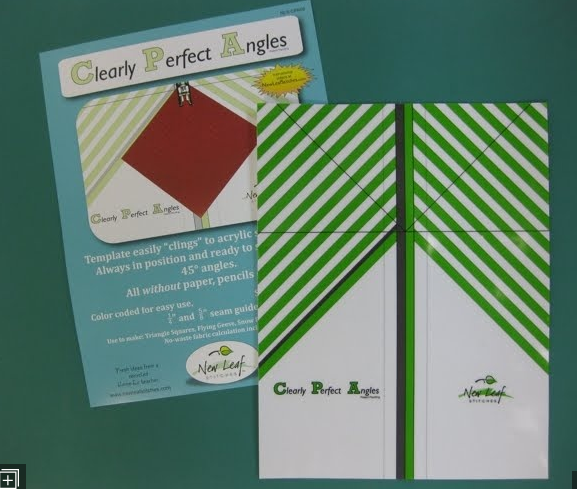 Think about the fabrics you want to use and get out there and get some of these great tools! Now you know which quilt I am wanting to make! It is an Ocean Waves quilt. My friend, Norma, has made one that I *need* to make. This is a photo of her finished top. Anyone interested in working on this with me? I am planning on beginning this in the new year, so plenty of time to consider. I have NOT mapped out a thing, but the QAL can go at your own pace. We will choose fabrics, then talk about cutting and assembly of the main block. So think about what colors you would like to use. If you are unsure, just Google "ocean waves quilts" and you will see a LOT of inspiration! Or you can check out my Pinterest page, I have an Ocean Waves board. I would love for some people to join in on this. Maybe I can make a button? I guess I will give that a try. Have a great weekend everyone and be sure and let me know if you will be joining in the HST fun! I still don't have my sojo back but I did manage to get started on my bee blocks for November. I cut them out and fused them now I need to stitch around them then out in the mail! I love the big one. It reminds me of looking at the moon or Jupiter. It should be an interesting quilt when she gets all the blocks put together. Are any of you in virtual bees? I like that I can make a few blocks each month. I also like that sometimes, I get to try things I might not otherwise have tried. 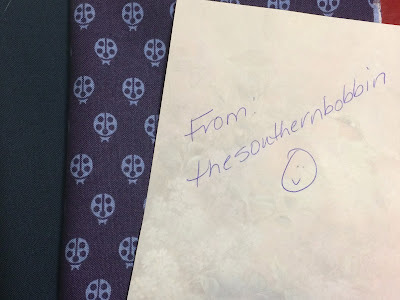 The best part is that all the quilts go to someone that needs them. It is a pretty simple way to give back and really does not take a huge amount of time. A bonus is that you get to use up some of your stash! I can always use some help with that! 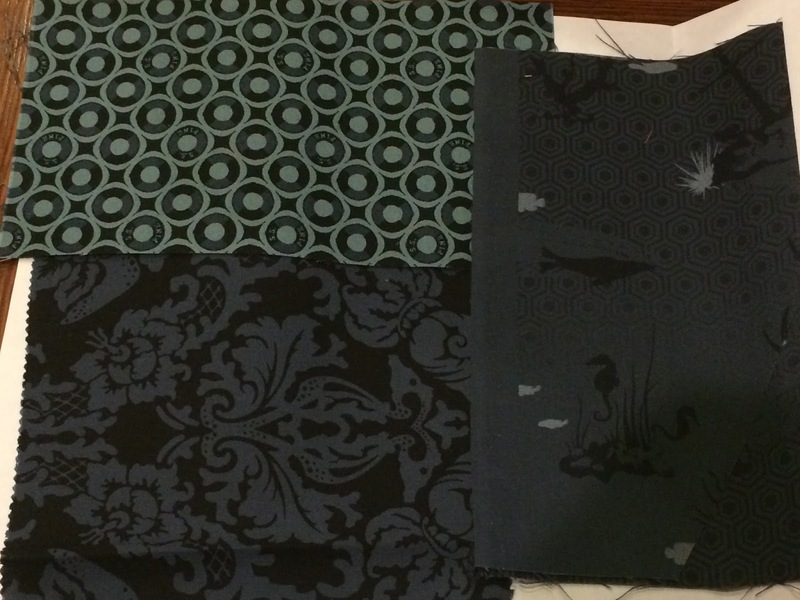 I should have a post talking about the QAL quilt that I want to make. I may be making mine as a Leader Ender project too. Are you all familiar with the Leader Ender concept? Bonnie Hunter wrote a whole book about this. She explains it all right here. 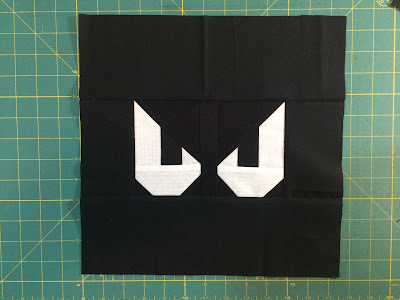 So check out the post tomorrow for info on the QAL quilt I want to make. Maybe you would like to make one with me! Well I have done exactly nothing since making the scary eyes. 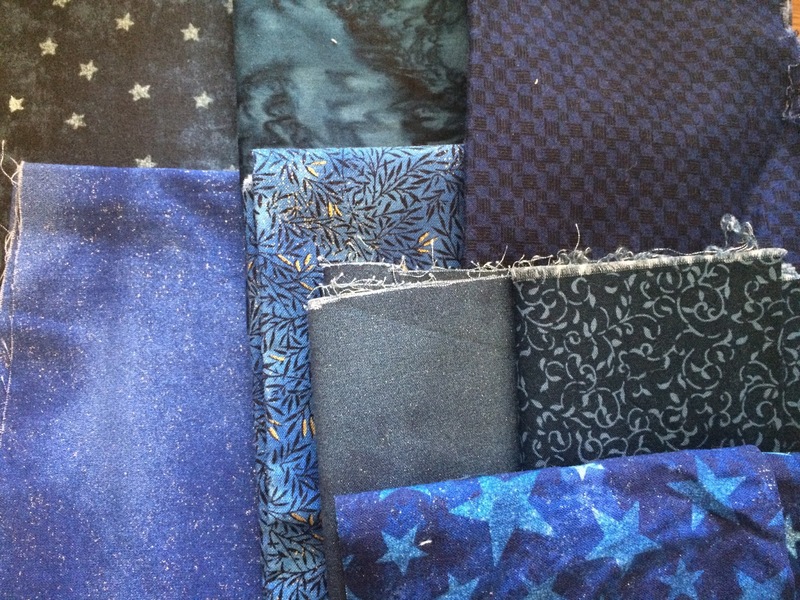 I have, however, been collecting navy blue fabrics for an upcoming quilt. I am on Instagram and under the #getyourquiltywishesgranted2 I asked for navy fabrics. 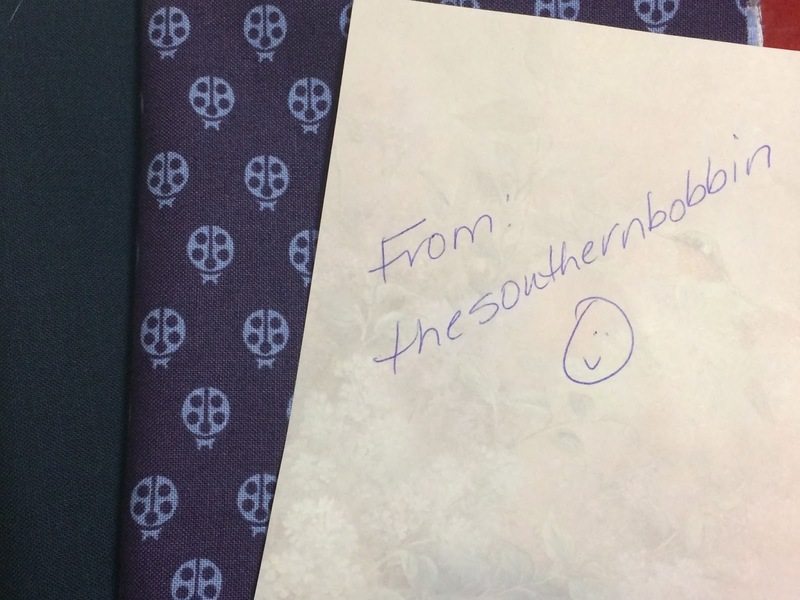 The happy mail came pouring in! I could not be more thrilled! I am thinking about doing this quilt as a QAL in the new year. That's all I am going to say for the moment. My inspiration quilt lives in Texas and I am waiting for permission to share the photo of it. Once I have that I will tell you all about it. 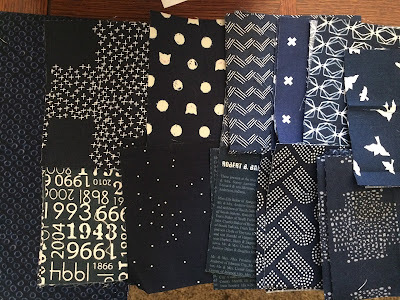 Is anyone out there interested in a QAL starting in the new year? 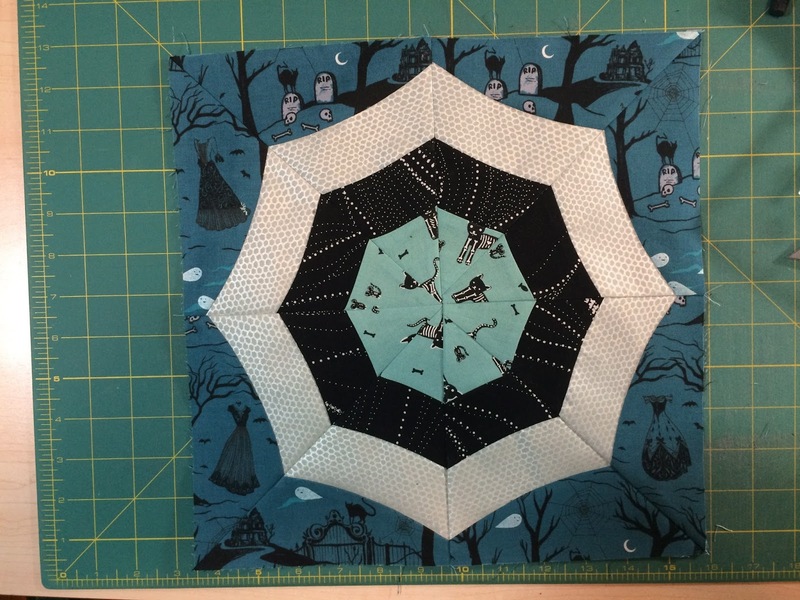 There are so many ways this quilt could be done. 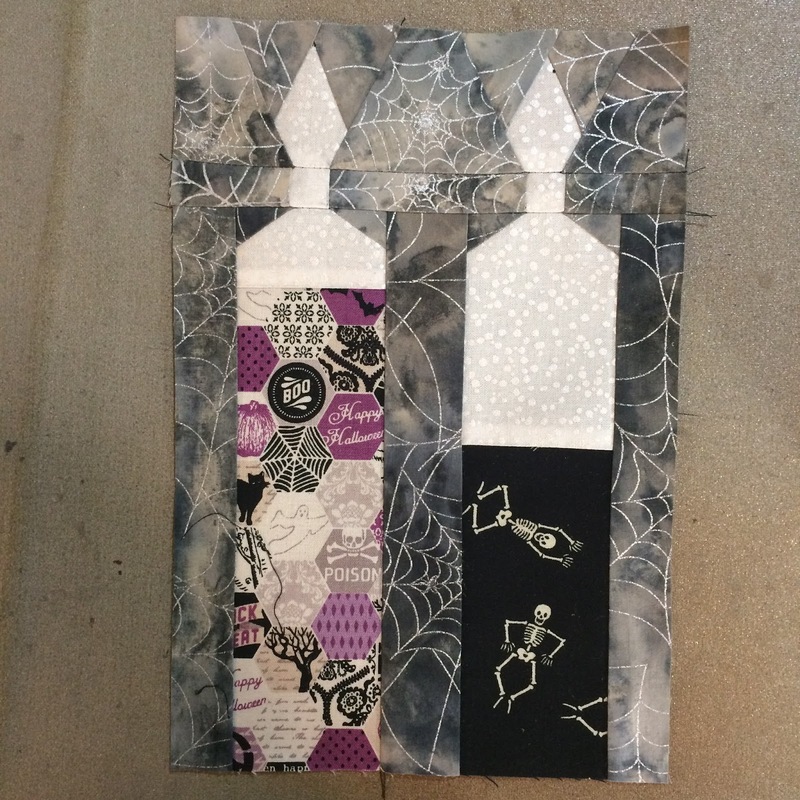 As a two color quilt, or scrappy, or themed. The possibilities are only limited by what you can think up! Please leave me a comment and let me know if it is even worth my time to make it a QAL. 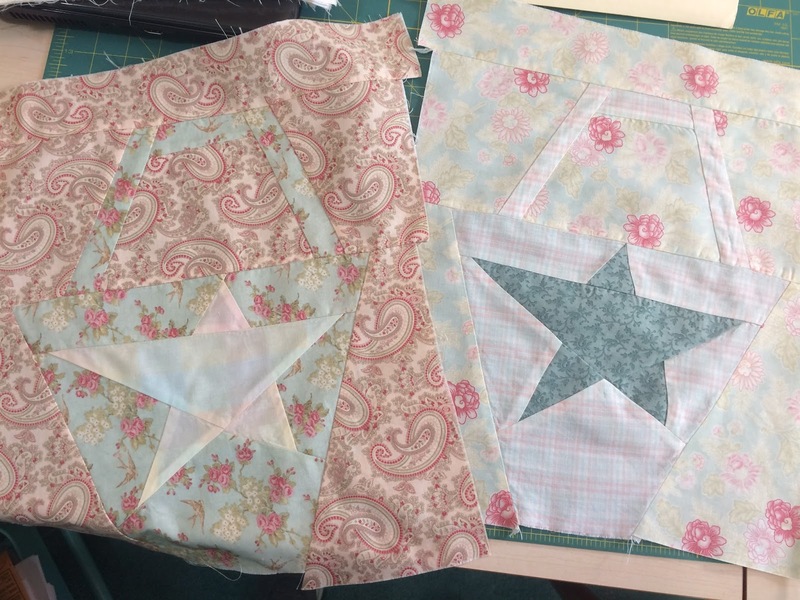 Tutorials are a lot of work and if there is no interest I will just make my quilt and post progress. 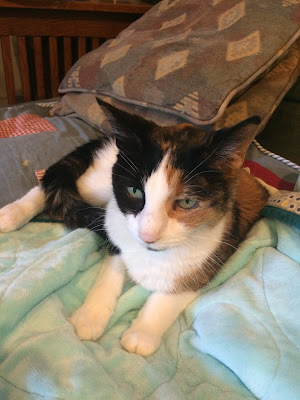 I still don't have much desire to sew, which is unfortunate as I have a LOT to get done. I am hoping if I just choose a block and start on that maybe it will come back. I did a lot of cleaning and errands on Saturday. Hubby printed out a pumpkin cake recipe that he wanted me to make so I decided that while I was watching me Spartans WIN for a change I would bake the cake. The recipe is from the Taste of Home website and you can find it here. 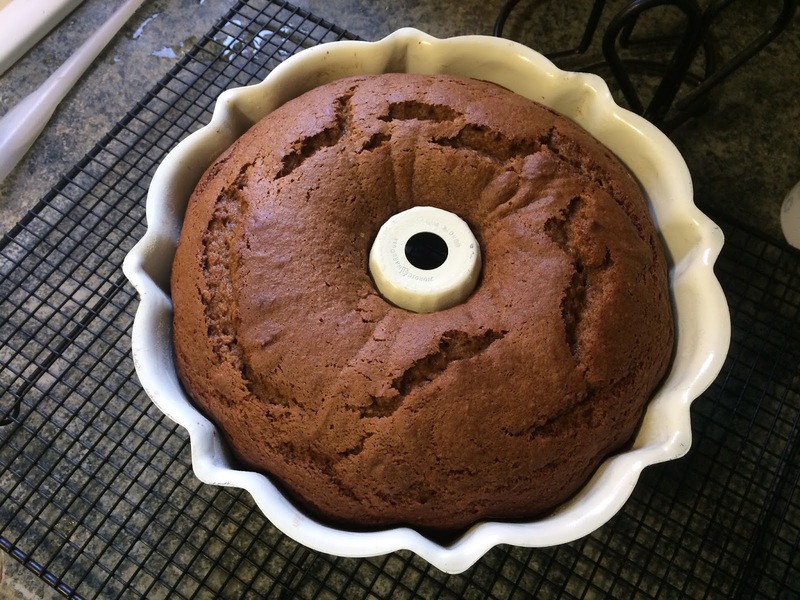 It was easy to do and the cake was fabulous. I substituted 1 cup of homemade applesauce for the 1 cup of oil. I think it was a great substitute. I did not miss the oil at all. Next time I would cut down on the amount of sugar. It called for 2 1/2 cups of sugar!!! Trying to make it more WW friendly, if cake can be that! I let it cool for 10 minutes in the pan then turned it out. This is before I glazed it. I used powdered sugar with some pumpkin pie spices in it for the glaze. My best friend was never far away from me all weekend. She has decided that she loves this quilt. With the fuzzy back it is very soft. 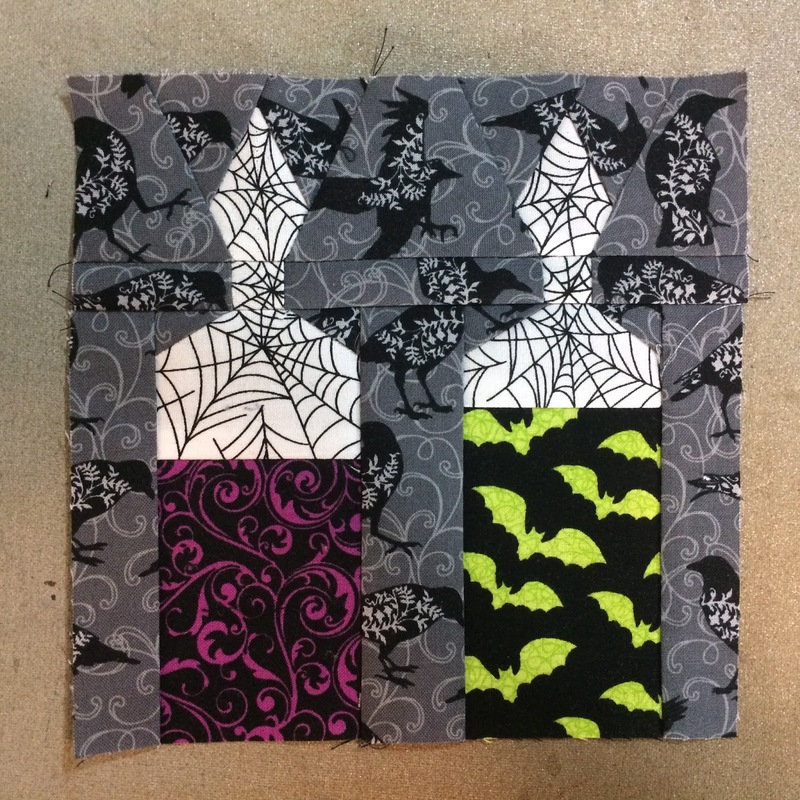 In addition, I made one more block for the Hallowedding quilt. These eyes were from a Block Lotto post. It was a little tricky to make and this pair took me about 2 hours! so I could figure out the sizes she used to make this set. I have another set of different eyes to make but I ran out of time. I hope everyone else had an enjoyable weekend too! I am back with my regularly scheduled posts now that the wedding is over. I, in all honesty, have not really had a lot of time to do very much. I have not felt like doing much since the wedding. Post wedding let down, I think. I did put all the Hallowedding blocks up on my design wall but not in the order they will go in. THAT is my big WIP for the moment. 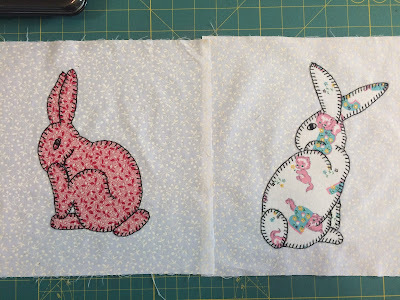 I managed to purchase some freezer paper yesterday so I am hoping to be able to sew a few more of the Buggy Barn Basket blocks but that will be after today. Sorry for the crappy photo but it was night and it is difficult to take a photo in my hallway! I can tell that I need more dark blocks . That was one good thing about putting all the blocks up on the wall. I did print out the next few blocks so that's also a start right? I had an interesting pretty low key weekend. 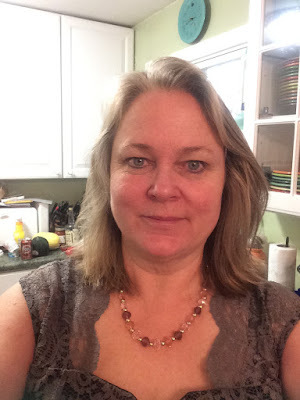 I am taking a class on Craft University that I will be blogging about when I finish. I did the first 2 lessons. Hubby has been working in the garage getting it cleaned up and organzied and he came across an old sewing machine caddy that was full of fabrics and blocks!!! Unfortunately they all smelled awful! I suspect they got wet or something. I brought them all inside and decided that I want to selvage them. So I filled the washer with warm water and oxyclean and tossed them in. I did not want to dry in the dryer so I brought them into my quilt room and pressed them all dry. Sigh. I still like them so I need to work on putting them into a quilt. The first set was a basket pattern by Buggy Barn. I always think of these as "shabby chic" for some reason. 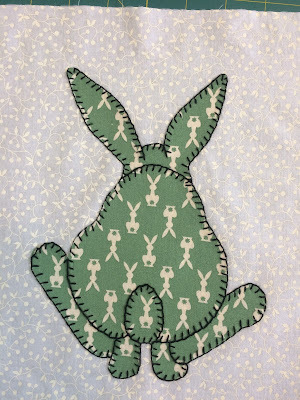 I think I will make a few more so I can get a bed sized quilt. Still thinking about this though. 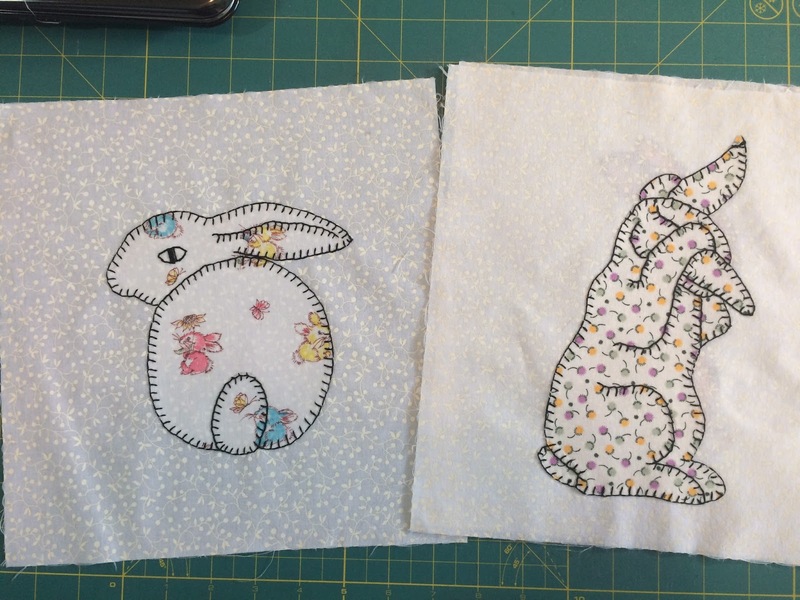 Next up are some bunnies. The patterns are from the book Grandma's Bunnies by Darcy Ashton. 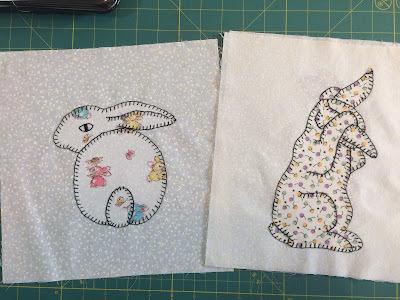 I did fusible and then hand stitched around them all. 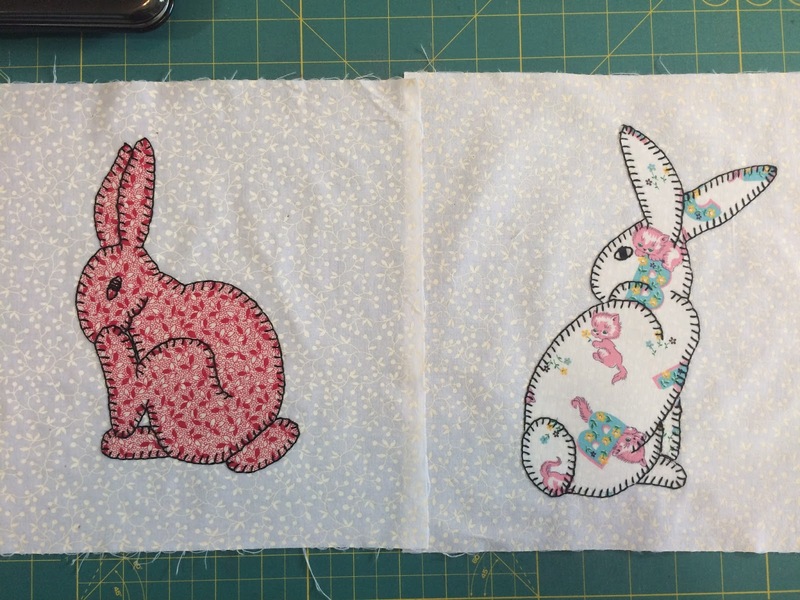 That bunny fabric on the left is actual vintage fabric. So is that cat fabric on the right. I also took a photo of my growing "keeper" collection, just for fun. I added the one on the far right during our trip to NY this year. If you see one I don't have please feel free to point me in the right direction! 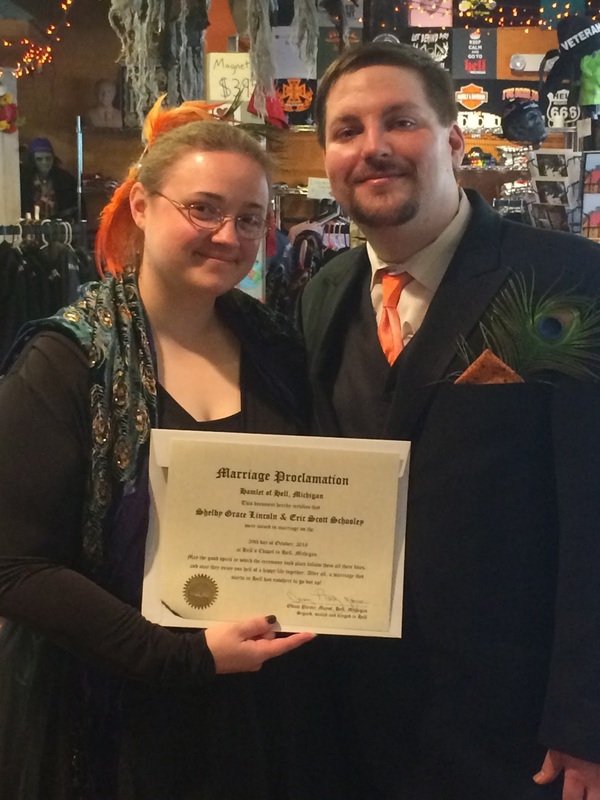 For anyone that reads this blog regularly you all know that my daughter got married last weekend. She is a VERY unconventional woman and did this entire thing her way. Did her parents always agree with her choices? No we did not, but we were there to support her every step of the way. Most of my time in the past month has been dedicated to wedding prep. have not had a spare minute to do one more thing this past week. 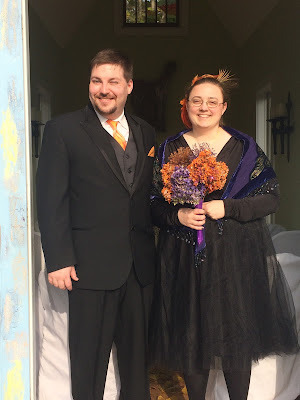 I will, however, share some wedding photos. I did not take many pictures so that I could be in the moment. We had a professional photographer so there will be family photos from that session. I will share a few I did manage to take with my phone though. 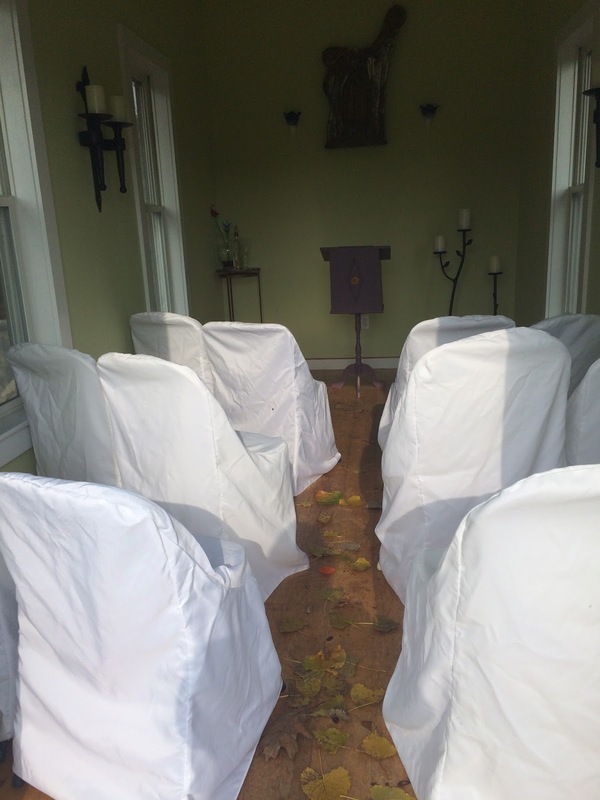 The weekend started with us prepping the reception hall. Eric's mom, sister, nephew, my other daughter and I did most of the hall set up. Eric and his dad did a lot of unloading as did my hubby. 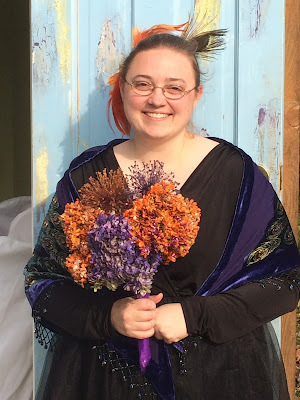 First up was putting up the Happy Hallowedding poster for the selfie station. My friend's mom was an artist when she was alive. 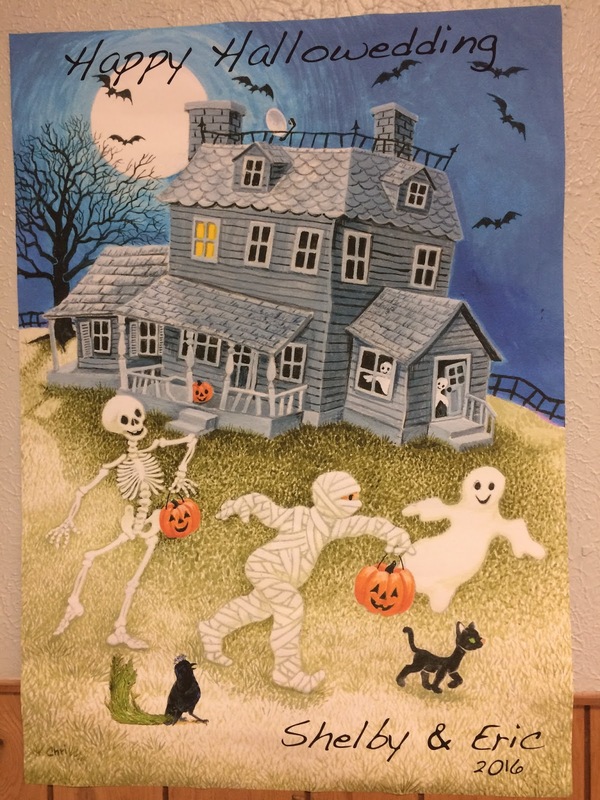 She drew the haunted house scene. My friend put in the lettering and the costumed raven. Directly across from the selfie station were things to wear, just in case you didn't dress up. This is what the hall looked like once we had the tables all decorated. Since there was no wedding party we just gave the bride and groom their own table. Eric's mom and sister did a fantastic job with the Trick-Or-Treating station! I made this weird veggie skeleton. I also made a cheeseball that looked like a spider but apparently I did not take a photo of that! Even though my daughter asked me not to make a bouquet I could not resist! 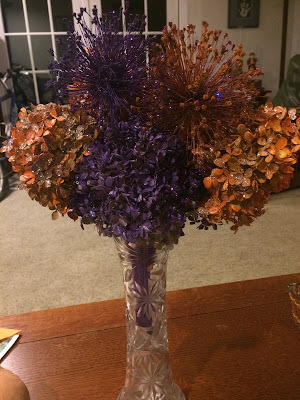 The Hydrangea's came from Eric's grandmother's garden and the Allium from my friend's garden. I spray painted and glittered them, then Kelsey and I used the purple ribbon to wrap the stems. I did receive a frantic phone call about an hour before we were supposed to leave saying Eric needed an orange pocket square for his suit and could I make him one. (it has Halloween themed prints on it). Also, in that same phone call, "we left our glasses at home can you go get them?" Adding an hour to our time for dollar store glasses? 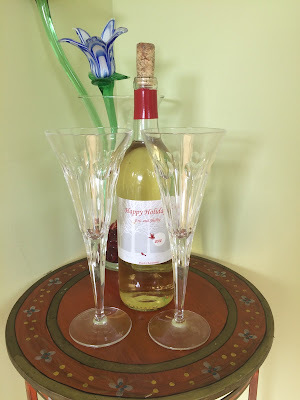 I had some Waterford glasses that we had given to my parents for their 50th anniversary. 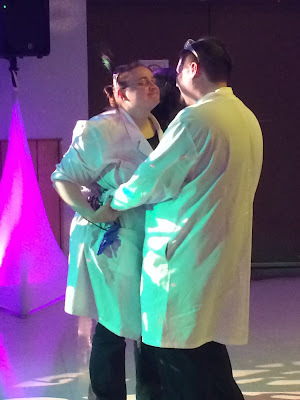 They were not exchanging rings so wanted to drink from each other's glasses at the ceremony. She said she wished they still had the wine they had made a few years ago to do the toast with. I opened my cupboard and asked, "Oh you mean this?" I still had my bottle! So I packed it in my cat wine tote and brought it all with us. This is the only photo I have of myself dressed up! I took it in my kitchen just before we left. 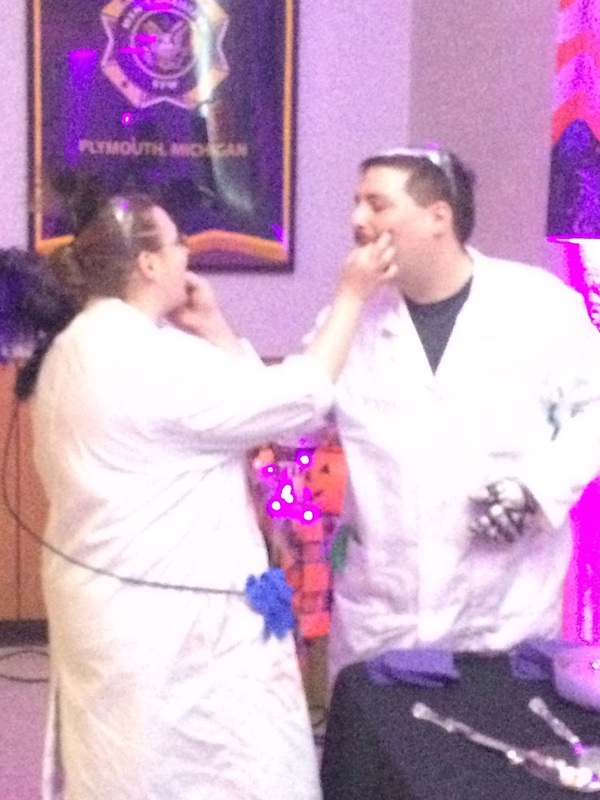 Here are the bride and groom. I really love that bouquet! I loved her hair piece and her shall. Peacocks galore! Party time. Everyone was getting into costume. 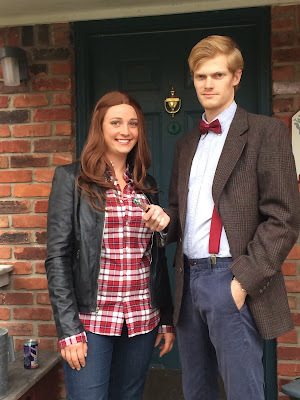 My other daughter and her boyfriend went as Amelia Pond and the Doctor. And while I completely HATE this photo of myself I am posting anyway. I went as the peacock queen and hubby went as a peacock trainer. 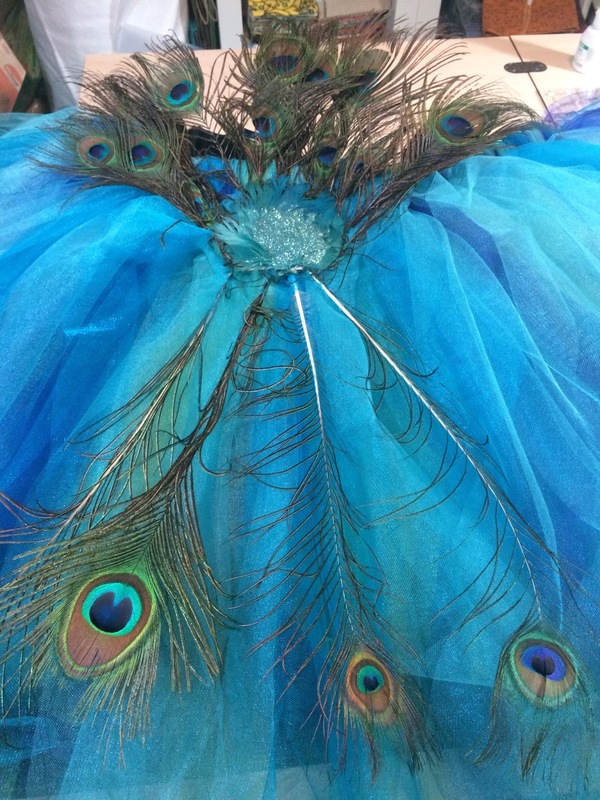 The back of my tutu was so much prettier. 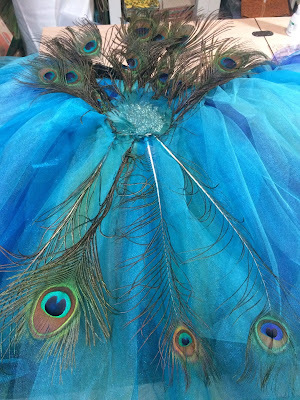 I hand sewed the feathers to the tutu. I didn't get a photo of my son but I know that the photographer did. I have to show you the cake. 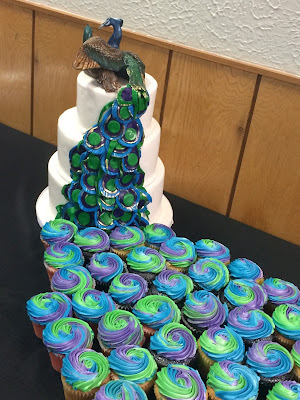 It came from Cake Crumbs in Southfield MI and I would totally recommend them! 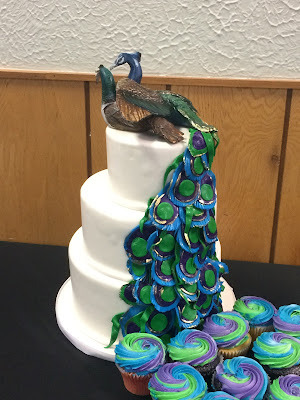 Shelby's friend made the peacocks for the cake topper and they were so sweet. The male has his wing around the female. LOVE how his tail ended up in cupcakes! All different flavors of cake, made it really fun! The sign out front of the hall. I had to basically beg to get them to do this for me. The "Mad Scicntists" entrance to "She Blinded Me With Science"
They didn't want to cut the cake it was so beautiful. as well as the server that had an etched peacock on it. They chose Cake By The Ocean as the cake cutting song. They were nice to each other with the cake. 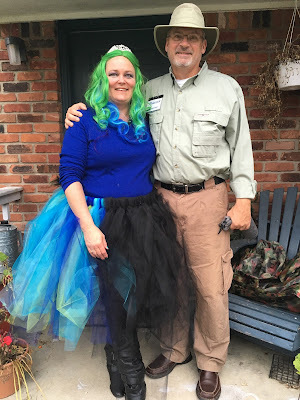 Mom and dad went as Amy Farah Fowler and Sheldon Cooper, the later years. Our fabulous DJ Joey, put this together. 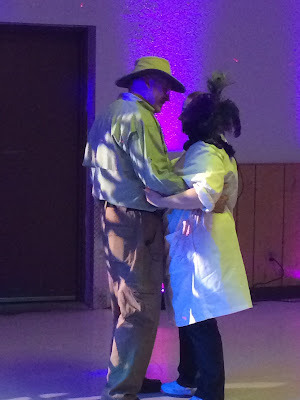 My niece, Jane wore the T-Rex costume and she was a HUGE hit on the dance floor! If you need a DJ you should totally look him up! 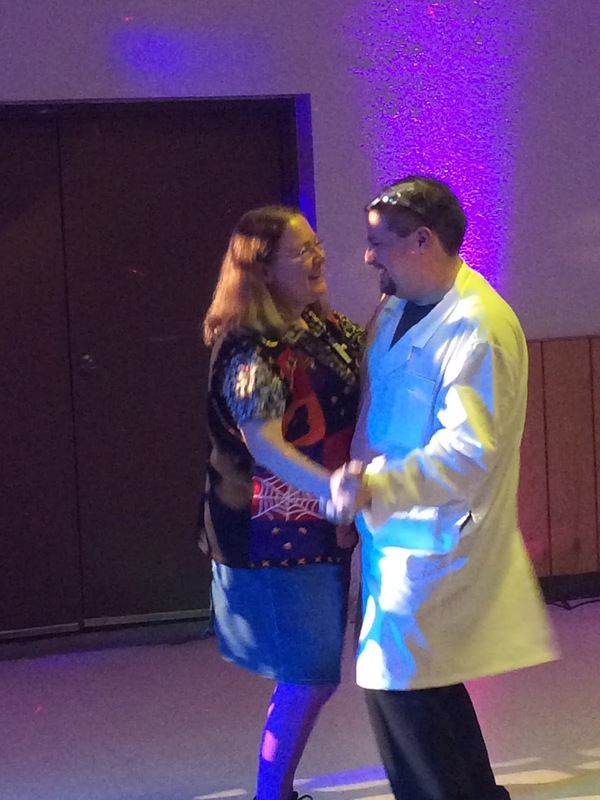 Hubby and I dancing, Shelby and Eric, friends, and the bottom one is most of my husband's family. 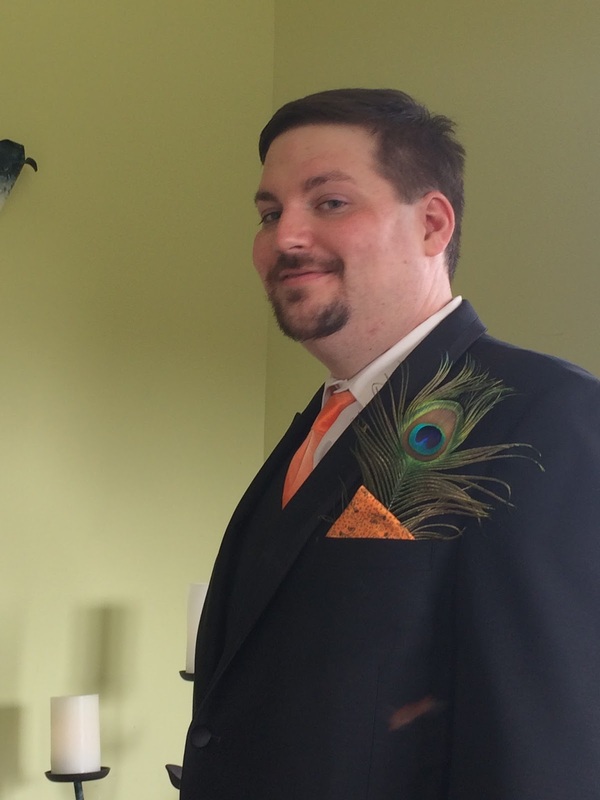 Plus you can see my son standing in front of me, next to the groom. If this photo is any indication of what is to come, I can't wait to see Amber's pics. 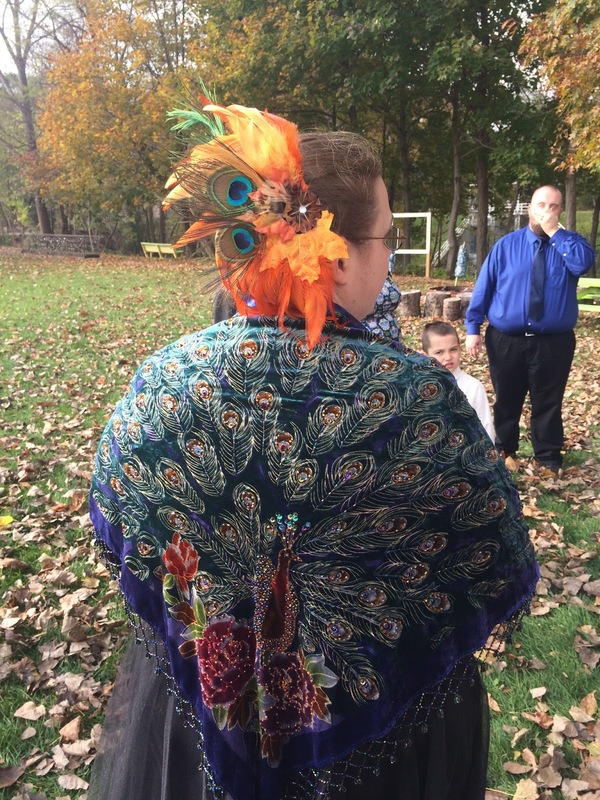 Amber Yanovich was our photographer. You can contact her through her website. I will have more pictures once we get some back from Amber. use the hashtag #happyhallowedding to post whatever photos they did take.